An Important and relevant portrait of America's early years! 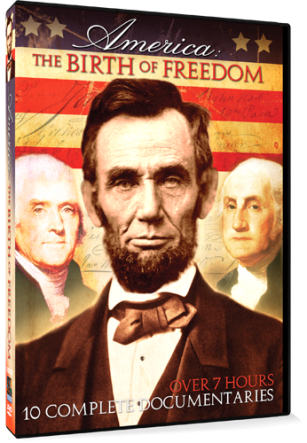 Embark on an exciting, historical journey through the battles and victories surrounding America's pursuit for freedom. This poignant documentary series is comprehensively presented through narration, photographs and paintings to create a visual history of America's founding ideals of liberty and freedom. This ten-part documentary series examines the people and events that led up to our nation's battle for independence against the world's largest military power during the Revolutionary War through the presidencies of freedom fighters Thomas Jefferson and Abraham Lincoln who were forever dedicated to the proposition that all men are created equal. After a series of taxes and laws that took power away from the 13 American Colonies, the British monarchy found resistance that lead to a revolution. From the Declaration of Independence, George Washington's armies, to the eventual British surrender at Yorktown, experience how these events birthed a new nation. As a man of the Enlightenment he was the principle author of the Declaration of Independence. Follow the journey of his life from childhood, to the colonial days of America, the events that lead to the American Revolutionary War and beyond. Abraham Lincoln lead the nation through a tremendous upheaval; a time when our country was pulling apart at the seams. This intimate portrait of Abraham Lincoln, using authentic stills of the time, will hopefully bring you a little closer in understanding the complexities of our 16th President of the United States. As the war that inflicted more casualties on America soldiers than any other, follow the events from Lincoln's victory in the presidential election of 1860 to Lee's surrender in Northern Virginia on April 9, 1865, at the McLean House. This is an intimate look into the Civil War as told by a Confederate Soldier who recorded his thoughts and feelings on paper. Understand the Civil War like never before as you see and hear events unfold from a man on the battlefield during our nation's most divided time in its history. Over 7 hours of captivating, historical storytelling.